Credit: Reprinted with permission from ACS Journal of Physical Chemistry Letters. Copyright 2018 American Chemical Society. PITTSBURGH (December 11, 2018) … Thanks in part to their distinct electronic, optical and chemical properties, nanomaterials are utilized in an array of diverse applications from chemical production to medicine and light-emitting devices. 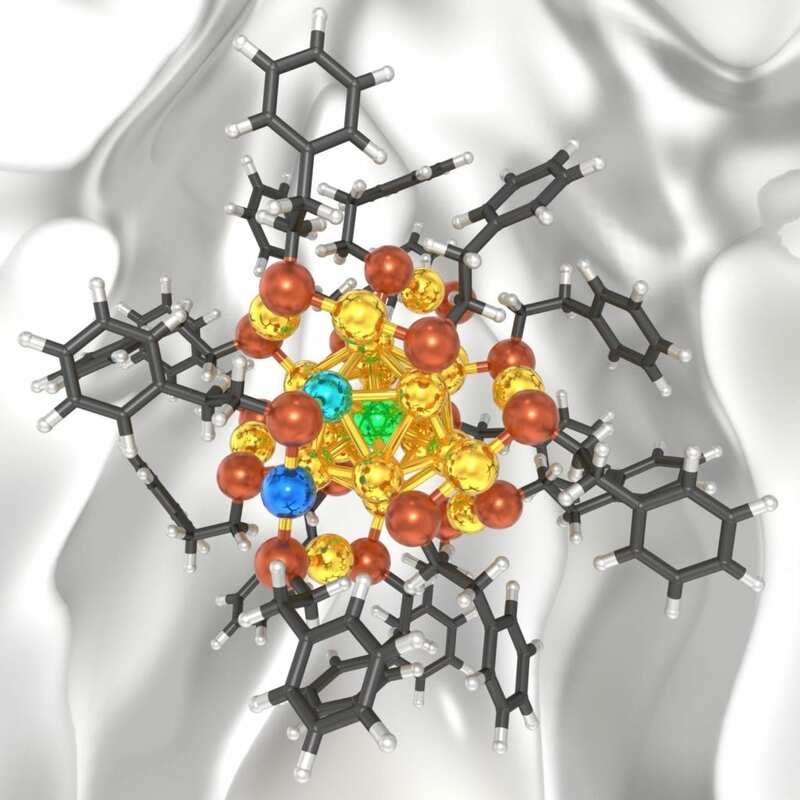 But when introducing another metal in their structure, also known as “doping,” researchers are unsure which position the metal will occupy and how it will affect the overall stability of the nanocluster, thereby increasing experimental time and costs. However, researchers from the University of Pittsburgh’s Swanson School of Engineering have developed a new theory to better predict how nanoclusters will behave when a given metal is introduced to their structure. The study, “Thermodynamic Stability of Ligand-Protected Metal Nanoclusters” (DOI: 10.1021/acs.jpclett.8b02679) was featured on the cover of the ACS Journal of Physical Chemistry Letters. Co-authors are Giannis Mpourmpakis, the Bicentennial Alumni Faculty Fellow and Assistant Professor of Chemical and Petroleum Engineering at the Swanson School, and PhD candidate and NSF Graduate Fellow Michael Taylor. Their findings connect with previous research focused on designing nanoparticles for catalytic applications.